The Meadows at Panther Valley is a low-maintenance, active lifestyle community located in Hackettstown, NJ. Baker Residential built the 312 high-end attached homes. 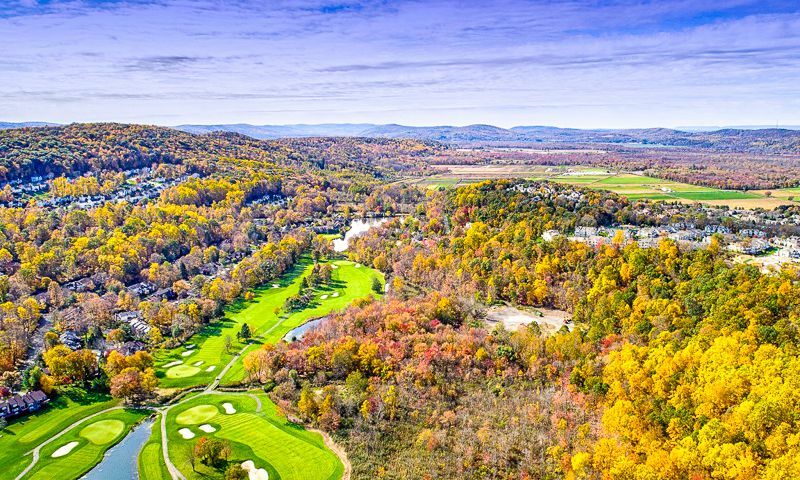 As a part of the Panther Valley master-planned community, residents have access to the amenities of the community like its clubhouse, outdoor pools, tennis courts, and more. Located conveniently near Newark and New York City, but far enough away to avoid the hassles of the city, homeowners will enjoy this community's prime location. Residents at The Meadows at Panther Valley have access to an impressive lineup of amenities that allow them to stay socially and physically active. As part of the Panther Valley master-planned community, homeowners will be able to use all of the amenities Panther Valley has to offer. A clubhouse at the entrance of the community is a social hub. Here residents can attend social events or rent out the multi-purpose rooms for private functions. Outdoors, there is are several pools with patios, perfect for swimming laps or cooling off on a summer day. There are two tennis courts and a basketball court along with a tot lot. Emphasizing the natural beauty of the area, Panther Valley has several parks and scenic ponds linked by walking paths. Baker Residential built 312 attached homes in The Meadows at Panther Valley. Nine floor plans are available that range in size from 1,904 and 2,847 square feet with three bedrooms, two-and-a-half bathrooms, and attached two-car garages. Ground-level master suites are featured on all models and have luxurious bathrooms with large tubs, separate shower stalls, and dual vanities. Kitchens have high-end features like hardwood cabinetry, granite countertops, and stainless steel appliances. Hardwood flooring is used throughout, except for carpeted master bedrooms. Homeowners at The Meadows at Panther Valley enjoy many social and recreational activities within the community. Social events and holiday parties at the clubhouse will allow neighbors to get to know one another. Residents can stay active with a brisk swim in the outdoor pool or a jog along the walking trails. Better still, homeowners have more time to enjoy the activities they love knowing lawn care, snow removal, and common area maintenance are all handled by the homeowners' association. The Meadows at Panther Valley is located in Hackettstown, NJ in the northern part of the state. Daily shopping is easy to take care of with a Weis Market, ShopRite, and Walmart just seven miles away along with several restaurants, retail stores, and the 14-screen Bow Tie Mansfield Cinema. The downtown area of Hackettstown is just five miles away. The historic town has charming shops, fine restaurants, summer festivals, and the cultural attractions of Centenary University. The community is located just 60 miles away from Manhattan making day or weekend trips to experience the world-class culture, amenities, shopping, dining, and sports convenient. When long-distance travel is required, Newark Liberty International Airport is 56 miles away. The Meadows at Panther Valley is a standout active lifestyle community that combines luxurious, low-maintenance homes with a prime location in Northern New Jersey. Check back soon for more information on the lifestyle in The Meadows at Panther Valley. Baker Residential built the 312 attached homes in The Meadows at Panther Valley. Nine floor plans are available that range in size from 1,904 and 2,847 square feet with three bedrooms, two-and-a-half bathrooms, and attached two-car garages. Ground-level master suites are featured on all models and have luxurious bathrooms with large tubs, separate shower stalls, and dual vanities. Kitchens have high-end features like hardwood cabinetry, granite countertops, and stainless steel appliances. Hardwood flooring is used throughout, except for carpeted master bedrooms. 55places.com is not affiliated with the developer(s) or homeowners association of The Meadows at Panther Valley. The information you submit is distributed to a 55places.com Partner Agent, who is a licensed real estate agent. The information regarding The Meadows at Panther Valley has not been verified or approved by the developer or homeowners association. Please verify all information prior to purchasing. 55places.com is not responsible for any errors regarding the information displayed on this website.